Tech Day kicks off with a focus on Smart Cities and Internet of Things. AT&T, Lyft and PSEG among other leading tech companies will discuss trends, challenges and the future. Acceleration will be the topic of lunch with a talk by Ann Rosenberg, Senior Vice President & Global Head of SAP Next-Gen, a Purpose Driven Innovation University and Community. Following her talk there will be a tech transfer panel. Then the annual Data Summit will conclude the afternoon. Brett Prescott from Facebook will kick off the program and he will be followed by two panels and a chat focusing on leveraging data, cybersecurity and quantum computing. The lots 26 and 30 are behind the center. 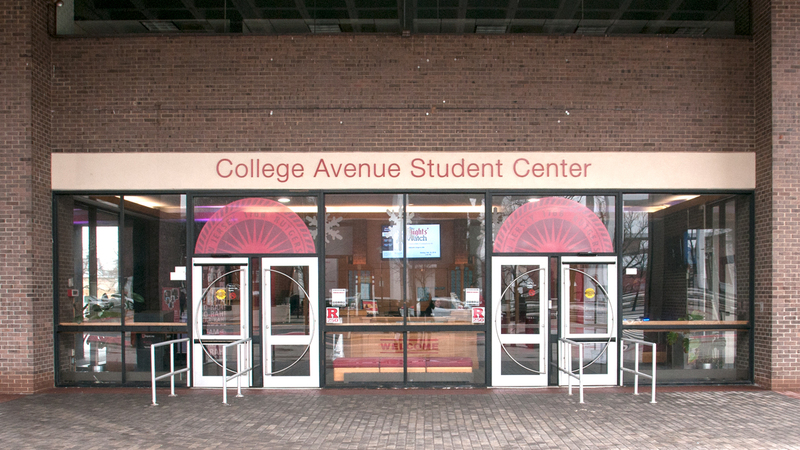 The College Ave Deck is 622 George St, New Brunswick NJ 08901 and the center is a short walk away. REGISTRATION IS NOW CLOSED. WALK-INS WELCOME! Brett Prescott is the Director of Global Partnerships at Facebook & Instagram who oversees a global team that develops long-term strategic partnerships with the world’s largest advertisers. He is a Professor of NYU Stern, in the Management Dept and Marketing Dept, teaching Social Media & Mobile Technology and The Strategy of Technological Innovation. At Facebook, Brett consults brands and fortune 100 CEOs, CMOs and CTOs to create and implement digital transformation agendas that enable businesses to thrive in a mobile-first world. For the past 7 years at Facebook, he’s lead teams that have shaped how marketers shift strategies and build innovation to embrace mobile advertising, mobile video, messaging, virtual and augmented reality, and eCommerce. This collaboration includes developing marketing campaigns and product innovations across Facebook, Instagram, Messenger, WhatsApp, and Oculus. Over his time at Facebook, he helped start Facebook's FMCG practice and Global Partnership Team. Brett has over two decades of marketing and management experience with extensive international business experience in technology innovation, management consulting and marketing. Prior to joining Facebook, Brett was a key member on the launch team for iheartradio and worked at CBS Television Group, where he helped define their digital strategy. Philanthropic works includes, working with Save the Children Foundation, The UN Foundation, LeanIn.org and UN Women. In this role, Brian oversees the Authority’s efforts to accelerate economic growth by developing and implementing initiatives and programs that enhance New Jersey’s long-term economic competitiveness in strategic sectors, such as clean energy, infrastructure, advanced manufacturing, technology, and life sciences. Prior to joining the EDA, Brian worked at McKinsey & Company where he was a leader in the firm’s public sector and infrastructure practices. His work focused largely on designing and implementing economic development and public-sector operations transformations. Over the course of his career, Brian has worked with 20+ government agencies across 12+ countries, spanning the local, state/provincial, and federal levels. Prior to consulting, he spent five years as an entrepreneur in the education technology space. Brian holds an M.B.A and a Masters of Public Policy from the University of Chicago where he was a Wallman Scholar and earned a B.S. in Engineering from Northwestern University. Ann is currently the General Manager of Lyft for New York and New Jersey. Originally joining Lyft in late 2014 as a Senior Analyst, she has held roles as Senior Mgr of Analytics, Head of Business Intelligence, and Product Manager of Experimentation before taking the role of GM. Before joining Lyft, Ann worked in various data, strategy, and product roles at LinkedIn and Google - focusing on LinkedIn's Premium platform and fraud analytics for Google Wallet. Prior to joining the tech world, Ann worked as a developer and analyst for a commercial real estate econometric consultancy within CBRE. Ann recently relocated back to NYC (closer to home) after several years in SF. She has also lived in Boston and Philadelphia, where she studied Information Mgmt Systems at Harvard Extension and Finance/Economics at the Wharton School at the University of Pennsylvania, respectively. Last but not least, she is an avid skier, a Division I athlete, and enjoys comedy shows! Mr. Paladino has served as President of the New Brunswick Development Corporation (DEVCO) since 1994. Under his leadership, DEVCO has initiated, developed, and managed nearly 5.4 million square feet in residential, commercial, academic, and institutional development valued at over $2.0 billion. Through the establishment of unique public-private partnerships, Mr. Paladino has successfully completed numerous projects that not only achieve key development objectives but also address important public policy goals. Under Paladino’s leadership, DEVCO is currently developing the new New Brunswick Performing Arts Center and residential tower, in partnership with Rutgers University, George Street Playhouse, and Middlesex County among others. DEVCO is also in the midst of developing the Atlantic City Gateway project, a major campus in Atlantic City, in partnership with Stockton University and South Jersey Gas. Paladino is also planning for the development of the Innovation and Technology Hub, a major development site in downtown New Brunswick. Successful projects recently completed under Mr. Paladino’s leadership include the $300 million College Avenue Redevelopment Initiative in New Brunswick and 15 Washington Renovation project in Newark (both developed in partnership with Rutgers University), the Gateway Transit Village mixed-use residential, office, and retail development, Wellness Plaza supermarket and fitness center, the Heldrich Hotel and Conference Center, and many other major redevelopment efforts. Paladino received both his B.A. and his law degree from Rutgers University, where he was also an Eagleton Fellow. He currently serves as a Distinguished Senior Policy Fellow at the Edward J. Bloustein School of Planning and Public Policy at Rutgers University and was honored by the University as a Loyal Son of Rutgers. He also serves as a Trustee of the Robert Wood Johnson University Hospital Board, Trustee of the Board of Crossroads of the American Revolution, and a Member of the Rutgers Business School Real Estate Executive Committee. Ted Zangari is a Member of Sills Cummis & Gross, a commercial law firm based in New Jersey. He chairs the firm’s Real Estate Department and serves on the firm’s Management and Executive Committees. He also chairs the firm’s Redevelopment Law and Public Policy & Governmental Affairs practice groups. Most recently, Mr. Zangari co-founded one of the country’s first interdisciplinary legal teams concentrating on the new federal Opportunity Zone program, from the perspectives of investors, fund managers and project developers seeking equity investments. Mr. Zangari has been recognized by many organizations, including the New Jersey State Chamber of Commerce (Business Advocate award), Kislak Real Estate Institute at Monmouth University (Service to Industry award) and NJ-NAIOP (Industry Service and Advocacy awards). He has been included on the list of the “Top 10 Power Players in the Garden State” by Real Estate New Jersey magazine, and over the last decade NJBIZ and ROI-NJ magazines have included him on their annual “Power” lists of the state’s business leaders and lists of New Jersey’s leading real estate professionals. He received a J.D. degree from Georgetown University Law Center and a B.A. degree from The George Washington University with special honors. Amy McIlvaine has spent her entire career focused on improving the public sector experience. This background has served her well in her current position as Business Development Manager, AT&T Smart Cities. Amy works with a variety of public sector organizations helping motivate their understanding of how to prepare their communities for the shift toward an ever-evolving digital world. This involves orchestrating the potential of what a connected smart city looks like and its impact on operations. Prior to AT&T, Amy was on the public-sector sales teams at Current powered by GE, Dell Software Group, SciQuest, Salesforce.com, LRN, EMC and Oracle. Her range of experience includes delivering enterprise on-premise, managed services, cloud, SaaS, PaaS and now sensor enabled IoT solutions. She started her career in the public sector working for the City of Philadelphia and the State of New York. Amy earned her BA at Boston College and MPA from New York University. President & CEO, Avlino, Inc. In the past 2 decades Ramana Jampala has founded, led investments, or was a Board of Director of numerous technology companies in Silicon Valley and New York/New Jersey in the United States. Ramana is currently the founding President and CEO of Avlino Inc – an AI and Data Analytics company. Prior to Avlino, Ramana was the President and CEO of Altior Inc – a Big Bata pioneering company, which was acquired by Exar (NYSE: EXAR). Earlier Ramana was a General Partner with SAS Investors, a Venture Capital fund in New York City. Ramana has invested in or served as the Board of Director on many of SAS portfolio investments including Tacit Networks (acquired by Packateer), Velox Semiconductors (acquired by Power Semiconductors), HydroGlobe (acquired by Graver Technologies), Textronics (acquired by Adidas), Protonex (public company) and Enpirion (acquired by Altera). Prior to SAS Investors, Ramana worked with Viant (NASDAQ: VIAN) as a Strategy Lead in San Francisco. He had his initial career with Rockwell Automation (Allen-Bradley) in the Control and Communications Group. Well recognized for his accomplishments, Ramana was awarded the “Financier of the Year” by New Jersey Technology Council, for leading more than $250M Investments in early stage companies in New Jersey. Ramana frequently teaches Technology Entrepreneurship at leading Business Schools in the United States, and is a Board of Advisors of numerous academic institutions. Ramana holds an MBA from London Business School, and graduated with distinction with a BS in Electronics Engineering from Pune University, India. Jayashree Iyangar is an Analytics Consultant and Insights expert at Mindtree with 15 years of experience in analytics consulting and delivery. She currently leads the data science and Insights center-of-excellence, within the Digital service line building analytics solutions for marketing teams for Fortune 500 clients. Jayashree started her career with airport operations and has led a variety of roles in operations, sales and analytics. Education: Undergraduate degree in physics from M.I.T. (1979) M.D. from University of California, San Francisco (1983) PhD. from M.I.T. (1988), solid state physics Awards: - Fellow of the American Physical Society, Division of Condensed Matter Physics, 2000. Citation: “For the discovery of new phenomena at half-filled Landau levels” - Co-recipient of the 2002 Oliver E. Buckley Prize in Condensed Matter Physics with Nicholas Read and Jainendra Jain. Citation: “For the theoretical and experimental work establishing the composite fermion model for the half-filled Landau level and other quantized Hall systems.” Employment: At Bell Labs for almost 30 years: Presently distinguished member of technical staff at Nokia Bell Labs. James Mahoney is the Executive Vice President of Professional Services for Spruce Technology, with responsibility for ensuring the firm's delivery of quality solutions and project services to clients nationwide. He brings Spruce his strengths in solution design, business technology alignment, strategic technology planning, and client/stakeholder relationship management. Prior to joining Spruce, Mr. Mahoney worked as Solutions Director for the New York City Department of Health and Mental Hygiene, where he engineered and implemented one of the largest municipal records repositories on the SharePoint platform worldwide. During his tenure with the City, Mr. Mahoney also successfully implemented award winning projects and programs in public health and administration, including a smoking cessation portal, a suite of applications supporting early childhood intervention programs, an analytical hospital information system, and a range of integrated applications for emergency management used City-wide during Hurricane Sandy response and recovery. Before his time with the NYC Department of Health and Mental Hygiene, Mr. Mahoney spent nearly 15 years in technology consulting, serving in various leadership and delivery roles. His successful track record of project and program delivery includes a $15 million effort in redesigning and retooling the entire shareholder services platform for a major financial client. He built and managed a reporting services center, delivered SharePoint training and Microsoft technology mentoring to several large organizations, and built a data services infrastructure from the ground up. He holds a degree from The College of New Jersey. Odysseus Marcopolus is a Managing Director at Smart IMS, a global technology solutions company integrating Application Development, Cloud Transformation Services, Managed Services and Professional Services. Odysseus currently leads the Technology Solutions Practice for Government Markets and is instrumental in helping craft the Smart IMS portfolio of products and services including Smart Cities, IoT, Blockchain, Big Data Analytics, Unified Communications and Software Defined Networks (SD-WAN). Prior to joining Smart IMS, Odysseus served as the Chief Operating Officer (COO) and Chief Information Officer (CIO) for the New Jersey Office of Information Technology (NJOIT), where he managed a staff of 600+ and a $180 million P&L, including $30 million in investment capital. As COO, he was instrumental in translating business strategy into a product roadmap and operating plan for the delivery of mission critical IT services to the State of New Jersey - a $37 billion enterprise - with responsibilities for public safety, social service delivery, economic development, taxation, motor vehicle services, child welfare, and more. Odysseus led the transformation of NJOIT to a revenue positive service provider, growing and refining an SLA-backed Service Catalog with product offerings including: The Garden State Network , a secure hybrid public-private enterprise network; Enterprise Data Center Services , Emergency Telecommunications & 911 Services , Cloud Connect , a 60,000 seat Office 365 hosted solution; Professional Services supporting more than 700 custom business applications, and a portfolio of Enterprise-Class Microservices . As a visionary, Odysseus was an early proponent of transforming the Customer User Experience (UX) through the innovative use of cross-domain Identity Management and Single-Sign-On services in UX designs. And, more recently, delivering on a more satisfying Customer Experience (CX) by leveraging integrated data management strategies, coupled with cloud based multi-device CRM channels. On his way to the C-Suite, Odysseus has been a hands on practitioner, manager, and thought leader on a wide array of technology domains including Enterprise Architecture Policy & Governance, DevOps, User & Customer Experience, Regulatory Compliance (e.g., PCI, HIPPA), Information Security, Application Delivery, and Cloud Transformation. Bruce is a CEO, entrepreneur, and strategic consultant in Artificial Intelligence and Machine Learning. He co-founded two AI/Machine learning companies, and with Molloy Group/Serviceware, achieved a successful IPO. He is particularly interested in how AI can be used for innovation, and to create new products and business models. Bruce invented and patented a “System and Method for Representing and Retrieving Knowledge in an Adaptive Cognitive Network” and has contributed to many award-winning products that are used by companies like Goldman Sachs, GE, AT&T, Reuters, Bloomberg, Hewlett Packard, Novartis, Dow Jones, and T-Mobile. His expertise is sought after by large corporations as well as startups needing help in In Digital Transformation, Product Strategy, and Business Development. Bruce studied physics and music at Columbia University and is a member of SpringBoard.ai, an AI strategic consulting firm that helps companies win in a rapidly accelerating world. Kristin is currently part of the Renewables & Energy Solutions group at PSE&G, where she participates in shaping PSE&G’s clean energy strategy. Her job involves advancing the conversation around EVs, energy efficiency, energy storage, and other clean energy topics. I have worked in the energy industry for more than ten years, holding various jobs in the clean energy space, energy trading and energy marketing. She hold's Bachelor’s of Science Degree in Economics from Penn State University. Sarah is a data professional with ten years of experience in business, marketing, and predictive analytics. She has a passion for communicating insights in a way that is accessible to non-technical audiences and drives business impact. Her work has spanned across roles in research, campaign strategy, and customer analytics for companies ranging from Global Fortune 50 to startups. She built and leads the marketing analytics team at Jet.com, providing advanced analytics and backend data support to marketing teams across brand, customer loyalty, and customer acquisition initiatives. Executive Director of Security and Expert Solutions, NIKSUN, Inc.
Darryle Merlette is a security and software professional with over 25 years experience designing, developing, and delivering software and security solutions to diverse markets. He is currently the Executive Director of Security and Expert Solutions at NIKSUN, Inc where he oversees the process of securing product offerings, developing signature and anomaly based network detections, creating advanced network analysis solutions, and managing government certifications. Darryle has been with NIKSUN for 19 years, and prior to that he held senior software engineering positions at Telcordia Technologies (formerly Bell Communications Research, now Ericsson/iconectiv) and Lucent Technologies (now Alcatel-Lucent). Darryle holds a BSE in Computer Science from Princeton University and an MSE in Computer Science and Engineering from the University of Michigan. He has been a Certified Information Systems Security Professional (CISSP) since 2003. Mayur serves as the CEO of Droice Labs, an AI/Big Data healthcare company based in NY. He received his PhD in Biomedical Engineering at Columbia University focused on data science methods. Mayur previously co-founded Ardent Cell Technologies, a cell therapeutics company in the diabetes space, where the technology is undergoing human clinical trials. Previously, Mayur worked with some of the largest management consulting firms designing strategy for artificial intelligence based healthcare offerings. He also worked at Cornell University developing genomic data generation pipelines towards the general goal of precision medicine. He worked at A-Star and the National University of Singapore to develop High Performance Computing technologies while consulting in acquisitions of similar assets. Mayur did his engineering at IIT Kanpur with a focus on computational technologies for high frequency data. He currently advises several companies on AI strategy and the “data play”. Mr. Holsinger is the founder of Working Man Digital, a consulting firm focused on corporate innovation, and has spent 15 years helping major enterprise companies leverage emerging technology to solve big problems. Founder of the first incubator for housing solutions with USC’s Marshall School of Business, Future of Shelter. Recently Sr. EIR at Bionic, helping global enterprise clients grow and launch new ventures. He has held key positions at fast-growing startups including Klout and Livefyre, where he led growth and corporate partnerships. He founded Pilot44, a leading innovation consulting practice, that was quickly acquired after founding. In addition, Mr. Holsinger has created and executive-produced a number of original television series for ABC, Fox, and the BBC. In 2018, he launched Code Thinking, a global event series bringing major enterprise and emerging technology together around pressing societal problems. The book, Code Thinking, is due out in Spring 2019. Garth lives and works in New York. Peter Melley is the Director, New Ventures at the University City Science Center overseeing both the QED and Phase 1 Ventures commercialization programs. The QED program works with academic researchers to de-risk their technologies in order to attract follow-on investment or expedite a tech-transfer event. Phase 1 Ventures focuses on long horizon technologies and increasing the value of IP assets which have been placed in Small Business Entities and are pursuing non-dilutive funding opportunities. Prior to this, Peter worked for two start-ups focusing on business and legal issues. Peter began his career as a corporate attorney at an AmLaw 50 law firm in Washington, DC. Peter holds a BS in Biology for The American University and a MS in Biotechnology and a JD, both from the University of Pennsylvania. [post_excerpt] => Brett Prescott is the Director of Global Partnerships at Facebook & Instagram who oversees a global team that develops long-term strategic partnerships with the world’s largest advertisers. He is a Professor of NYU Stern, in the Management Dept and Marketing Dept, teaching Social Media & Mobile Technology and The Strategy of Technological Innovation. At Facebook, Brett consults brands and fortune 100 CEOs, CMOs and CTOs to create and implement digital transformation agendas that enable businesses to thrive in a mobile-first world. For the past 7 years at Facebook, he’s lead teams that have shaped how marketers shift strategies and build innovation to embrace mobile advertising, mobile video, messaging, virtual and augmented reality, and eCommerce. This collaboration includes developing marketing campaigns and product innovations across Facebook, Instagram, Messenger, WhatsApp, and Oculus. Over his time at Facebook, he helped start Facebook's FMCG practice and Global Partnership Team. Brett has over two decades of marketing and management experience with extensive international business experience in technology innovation, management consulting and marketing. Prior to joining Facebook, Brett was a key member on the launch team for iheartradio and worked at CBS Television Group, where he helped define their digital strategy. Philanthropic works includes, working with Save the Children Foundation, The UN Foundation, LeanIn.org and UN Women. [post_excerpt] => In this role, Brian oversees the Authority’s efforts to accelerate economic growth by developing and implementing initiatives and programs that enhance New Jersey’s long-term economic competitiveness in strategic sectors, such as clean energy, infrastructure, advanced manufacturing, technology, and life sciences. Prior to joining the EDA, Brian worked at McKinsey & Company where he was a leader in the firm’s public sector and infrastructure practices. His work focused largely on designing and implementing economic development and public-sector operations transformations. Over the course of his career, Brian has worked with 20+ government agencies across 12+ countries, spanning the local, state/provincial, and federal levels. Prior to consulting, he spent five years as an entrepreneur in the education technology space. Brian holds an M.B.A and a Masters of Public Policy from the University of Chicago where he was a Wallman Scholar and earned a B.S. in Engineering from Northwestern University. [post_excerpt] => Ann is currently the General Manager of Lyft for New York and New Jersey. Originally joining Lyft in late 2014 as a Senior Analyst, she has held roles as Senior Mgr of Analytics, Head of Business Intelligence, and Product Manager of Experimentation before taking the role of GM. Before joining Lyft, Ann worked in various data, strategy, and product roles at LinkedIn and Google - focusing on LinkedIn's Premium platform and fraud analytics for Google Wallet. Prior to joining the tech world, Ann worked as a developer and analyst for a commercial real estate econometric consultancy within CBRE. Ann recently relocated back to NYC (closer to home) after several years in SF. She has also lived in Boston and Philadelphia, where she studied Information Mgmt Systems at Harvard Extension and Finance/Economics at the Wharton School at the University of Pennsylvania, respectively. Last but not least, she is an avid skier, a Division I athlete, and enjoys comedy shows! Ann Rosenberg leads SAP Next-Gen, a purpose driven innovation university and community aligned with SAP’s commitment to the 17 UN Global Goals for sustainable development, and supporting SAP’s 388,000+ customers across 25 industries in 180+ countries. The community leverages 3,500+ educational institutions in 113 countries, 100+ SAP Next-Gen labs/hubs at universities and at partner and SAP locations, 38+ SAP Next-Gen Chapters, as well as startups, accelerators, tech community partners, venture firms, futurists, and purpose driven institutions. The community also leverages SAP’s 100+ innovation and development centers and SAP’s network of 17,000+ partner companies. SAP Next-Gen connects customers to academic thought leaders and researchers, students, startups, accelerators, tech community partners, purpose driven partners, venture firms, futurists, and SAP experts to reimagine the future of industries and the intelligent enterprise, seed in disruptive innovation with startups, and build skills for digital futures. Customers can benefit from SAP Next-Gen services as well as events where digital innovators come together in an open “innovation with purpose” community to foster the future of industries with SAP’s latest technologies. Ann is the global lead for #sheinnovates in collaboration with UN Women, to drive industry-wide action to make innovation and technology work better for young women and girls. Ann was voted top 20 blockchain female influencers in 2017. [post_excerpt] => Mr. Paladino has served as President of the New Brunswick Development Corporation (DEVCO) since 1994. Under his leadership, DEVCO has initiated, developed, and managed nearly 5.4 million square feet in residential, commercial, academic, and institutional development valued at over $2.0 billion. Through the establishment of unique public-private partnerships, Mr. Paladino has successfully completed numerous projects that not only achieve key development objectives but also address important public policy goals. Under Paladino’s leadership, DEVCO is currently developing the new New Brunswick Performing Arts Center and residential tower, in partnership with Rutgers University, George Street Playhouse, and Middlesex County among others. DEVCO is also in the midst of developing the Atlantic City Gateway project, a major campus in Atlantic City, in partnership with Stockton University and South Jersey Gas. Paladino is also planning for the development of the Innovation and Technology Hub, a major development site in downtown New Brunswick. Successful projects recently completed under Mr. Paladino’s leadership include the $300 million College Avenue Redevelopment Initiative in New Brunswick and 15 Washington Renovation project in Newark (both developed in partnership with Rutgers University), the Gateway Transit Village mixed-use residential, office, and retail development, Wellness Plaza supermarket and fitness center, the Heldrich Hotel and Conference Center, and many other major redevelopment efforts. Paladino received both his B.A. and his law degree from Rutgers University, where he was also an Eagleton Fellow. He currently serves as a Distinguished Senior Policy Fellow at the Edward J. Bloustein School of Planning and Public Policy at Rutgers University and was honored by the University as a Loyal Son of Rutgers. He also serves as a Trustee of the Robert Wood Johnson University Hospital Board, Trustee of the Board of Crossroads of the American Revolution, and a Member of the Rutgers Business School Real Estate Executive Committee. [post_excerpt] => Ted Zangari is a Member of Sills Cummis & Gross, a commercial law firm based in New Jersey. He chairs the firm’s Real Estate Department and serves on the firm’s Management and Executive Committees. He also chairs the firm’s Redevelopment Law and Public Policy & Governmental Affairs practice groups. Most recently, Mr. Zangari co-founded one of the country’s first interdisciplinary legal teams concentrating on the new federal Opportunity Zone program, from the perspectives of investors, fund managers and project developers seeking equity investments. Mr. Zangari has been recognized by many organizations, including the New Jersey State Chamber of Commerce (Business Advocate award), Kislak Real Estate Institute at Monmouth University (Service to Industry award) and NJ-NAIOP (Industry Service and Advocacy awards). He has been included on the list of the “Top 10 Power Players in the Garden State” by Real Estate New Jersey magazine, and over the last decade NJBIZ and ROI-NJ magazines have included him on their annual “Power” lists of the state’s business leaders and lists of New Jersey’s leading real estate professionals. He received a J.D. degree from Georgetown University Law Center and a B.A. degree from The George Washington University with special honors. [post_excerpt] => Amy McIlvaine has spent her entire career focused on improving the public sector experience. This background has served her well in her current position as Business Development Manager, AT&T Smart Cities. Amy works with a variety of public sector organizations helping motivate their understanding of how to prepare their communities for the shift toward an ever-evolving digital world. This involves orchestrating the potential of what a connected smart city looks like and its impact on operations. Prior to AT&T, Amy was on the public-sector sales teams at Current powered by GE, Dell Software Group, SciQuest, Salesforce.com, LRN, EMC and Oracle. Her range of experience includes delivering enterprise on-premise, managed services, cloud, SaaS, PaaS and now sensor enabled IoT solutions. She started her career in the public sector working for the City of Philadelphia and the State of New York. Amy earned her BA at Boston College and MPA from New York University. [post_excerpt] => In the past 2 decades Ramana Jampala has founded, led investments, or was a Board of Director of numerous technology companies in Silicon Valley and New York/New Jersey in the United States. Ramana is currently the founding President and CEO of Avlino Inc – an AI and Data Analytics company. Prior to Avlino, Ramana was the President and CEO of Altior Inc – a Big Bata pioneering company, which was acquired by Exar (NYSE: EXAR). Earlier Ramana was a General Partner with SAS Investors, a Venture Capital fund in New York City. Ramana has invested in or served as the Board of Director on many of SAS portfolio investments including Tacit Networks (acquired by Packateer), Velox Semiconductors (acquired by Power Semiconductors), HydroGlobe (acquired by Graver Technologies), Textronics (acquired by Adidas), Protonex (public company) and Enpirion (acquired by Altera). Prior to SAS Investors, Ramana worked with Viant (NASDAQ: VIAN) as a Strategy Lead in San Francisco. He had his initial career with Rockwell Automation (Allen-Bradley) in the Control and Communications Group. Well recognized for his accomplishments, Ramana was awarded the “Financier of the Year” by New Jersey Technology Council, for leading more than $250M Investments in early stage companies in New Jersey. Ramana frequently teaches Technology Entrepreneurship at leading Business Schools in the United States, and is a Board of Advisors of numerous academic institutions. Ramana holds an MBA from London Business School, and graduated with distinction with a BS in Electronics Engineering from Pune University, India. [post_excerpt] => Jayashree Iyangar is an Analytics Consultant and Insights expert at Mindtree with 15 years of experience in analytics consulting and delivery. She currently leads the data science and Insights center-of-excellence, within the Digital service line building analytics solutions for marketing teams for Fortune 500 clients. Jayashree started her career with airport operations and has led a variety of roles in operations, sales and analytics. - Fellow of the American Physical Society, Division of Condensed Matter Physics, 2000. - Co-recipient of the 2002 Oliver E. Buckley Prize in Condensed Matter Physics with Nicholas Read and Jainendra Jain. Presently distinguished member of technical staff at Nokia Bell Labs. [post_excerpt] => James Mahoney is the Executive Vice President of Professional Services for Spruce Technology, with responsibility for ensuring the firm's delivery of quality solutions and project services to clients nationwide. He brings Spruce his strengths in solution design, business technology alignment, strategic technology planning, and client/stakeholder relationship management. Prior to joining Spruce, Mr. Mahoney worked as Solutions Director for the New York City Department of Health and Mental Hygiene, where he engineered and implemented one of the largest municipal records repositories on the SharePoint platform worldwide. During his tenure with the City, Mr. Mahoney also successfully implemented award winning projects and programs in public health and administration, including a smoking cessation portal, a suite of applications supporting early childhood intervention programs, an analytical hospital information system, and a range of integrated applications for emergency management used City-wide during Hurricane Sandy response and recovery. Before his time with the NYC Department of Health and Mental Hygiene, Mr. Mahoney spent nearly 15 years in technology consulting, serving in various leadership and delivery roles. His successful track record of project and program delivery includes a $15 million effort in redesigning and retooling the entire shareholder services platform for a major financial client. He built and managed a reporting services center, delivered SharePoint training and Microsoft technology mentoring to several large organizations, and built a data services infrastructure from the ground up. He holds a degree from The College of New Jersey. custom business applications, and a portfolio of Enterprise-Class Microservices . strategies, coupled with cloud based multi-device CRM channels. (e.g., PCI, HIPPA), Information Security, Application Delivery, and Cloud Transformation. Bruce is a CEO, entrepreneur, and strategic consultant in Artificial Intelligence and Machine Learning. He co-founded two AI/Machine learning companies, and with Molloy Group/Serviceware, achieved a successful IPO. He is particularly interested in how AI can be used for innovation, and to create new products and business models. Bruce invented and patented a “System and Method for Representing and Retrieving Knowledge in an Adaptive Cognitive Network” and has contributed to many award-winning products that are used by companies like Goldman Sachs, GE, AT&T, Reuters, Bloomberg, Hewlett Packard, Novartis, Dow Jones, and T-Mobile. His expertise is sought after by large corporations as well as startups needing help in In Digital Transformation, Product Strategy, and Business Development. Bruce studied physics and music at Columbia University and is a member of SpringBoard.ai, an AI strategic consulting firm that helps companies win in a rapidly accelerating world. than ten years, holding various jobs in the clean energy space, energy trading and energy marketing. She hold's Bachelor’s of Science Degree in Economics from Penn State University. [post_excerpt] => Sarah is a data professional with ten years of experience in business, marketing, and predictive analytics. She has a passion for communicating insights in a way that is accessible to non-technical audiences and drives business impact. Her work has spanned across roles in research, campaign strategy, and customer analytics for companies ranging from Global Fortune 50 to startups. She built and leads the marketing analytics team at Jet.com, providing advanced analytics and backend data support to marketing teams across brand, customer loyalty, and customer acquisition initiatives. [post_excerpt] => Darryle Merlette is a security and software professional with over 25 years experience designing, developing, and delivering software and security solutions to diverse markets. He is currently the Executive Director of Security and Expert Solutions at NIKSUN, Inc where he oversees the process of securing product offerings, developing signature and anomaly based network detections, creating advanced network analysis solutions, and managing government certifications. Darryle has been with NIKSUN for 19 years, and prior to that he held senior software engineering positions at Telcordia Technologies (formerly Bell Communications Research, now Ericsson/iconectiv) and Lucent Technologies (now Alcatel-Lucent). Darryle holds a BSE in Computer Science from Princeton University and an MSE in Computer Science and Engineering from the University of Michigan. He has been a Certified Information Systems Security Professional (CISSP) since 2003. [post_excerpt] => Mayur serves as the CEO of Droice Labs, an AI/Big Data healthcare company based in NY. He received his PhD in Biomedical Engineering at Columbia University focused on data science methods. Mayur previously co-founded Ardent Cell Technologies, a cell therapeutics company in the diabetes space, where the technology is undergoing human clinical trials. Previously, Mayur worked with some of the largest management consulting firms designing strategy for artificial intelligence based healthcare offerings. He also worked at Cornell University developing genomic data generation pipelines towards the general goal of precision medicine. He worked at A-Star and the National University of Singapore to develop High Performance Computing technologies while consulting in acquisitions of similar assets. Mayur did his engineering at IIT Kanpur with a focus on computational technologies for high frequency data. He currently advises several companies on AI strategy and the “data play”. Thinking, is due out in Spring 2019. Garth lives and works in New York. [post_excerpt] => Peter Melley is the Director, New Ventures at the University City Science Center overseeing both the QED and Phase 1 Ventures commercialization programs. The QED program works with academic researchers to de-risk their technologies in order to attract follow-on investment or expedite a tech-transfer event. Phase 1 Ventures focuses on long horizon technologies and increasing the value of IP assets which have been placed in Small Business Entities and are pursuing non-dilutive funding opportunities. Prior to this, Peter worked for two start-ups focusing on business and legal issues. Peter began his career as a corporate attorney at an AmLaw 50 law firm in Washington, DC. Peter holds a BS in Biology for The American University and a MS in Biotechnology and a JD, both from the University of Pennsylvania.